Abstract: Currently the mode of educational practice in physical education specialty in China has such defects as little time and undiversified objectives, failing to adapt to the need of social development for professionals. The au-thors suggested that the mode of practice should be reformed, i.e. into a mode of practice that combines “compul-sory courses” with “optional courses”. 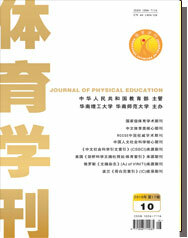 The author expatiated on the mode of practice that combines “compulsory courses” with “optional courses” in physical education specialty, and that such a mode will be conducive to resolv-ing the deficiency of practice time of students majoring in physical education, widening their field of professional vision, and enhancing their comprehensive capability.